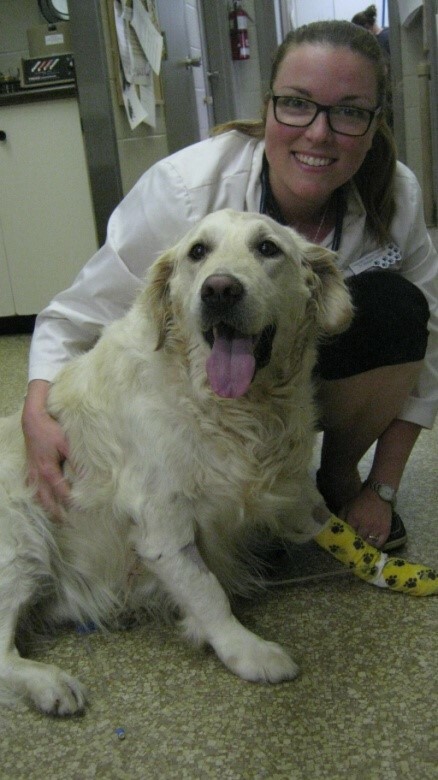 Ziggy is a 5 year old Golden Retriever that came to see us for feeling very under the weather. Ziggy had no appetite and had been vomiting. He was very dehydrated and for normally rambunctious dog, Ziggy was absolutely listless. Ziggy was immediately admitted in hospital and we started to get the bottom of the puzzle… what was making Ziggy feel so crummy? Based on Ziggy’s history, clinical signs and diagnostic work up, Leptospirosis was one of our top differentials. Leptospirosis is a bacterial disease that can affect both animals and humans. It is a microscopic, cork screw shaped bacteria that is transmitted through the urine of rodents and wildlife. Typically, a dog that drinks from puddles, is out on trails, up at the cottage or frequenting any place where wildlife and rodents have access is at risk of consuming this bacteria. Once inoculated by the bacteria, it can begin to affect both liver and kidney function. This can be life threatening as both the liver and the kidneys are the two most important “filtering organs” in the body. Leptospirosis is also considered zoonotic, meaning that it can be spread from animals to humans. In humans, Leptospirosis can cause similar liver and kidney damage along with meningitis, respiratory distress and even death. Ziggy spent a week with us in hospital. His dehydration and kidneys were treated with the help of intravenous fluids. The bacteria was killed using IV antibiotics until Ziggy was feeling well enough to keep food down, at which point he was switched to oral antibiotics. He was given medicine to help support his liver and help settle his stomach. Ziggy was a trooper! After a week-long stay with us, Ziggy’s liver and kidneys showed drastic improvement. He was finally back to himself – tail wagging, eating and happy to go out for his walks. Although making fast friends with the staff here at Clappison’s, Ziggy was happy to return home to both his human and canine family members. Ziggy, his owners and the staff at Clappison Animal Hospital wanted to share his story because they wanted to bring awareness to other dog owners about the disease. Although the risk cannot be eliminated entirely through vaccination, the risk of Leptospirosis (aka. Lepto) can be significantly reduced through annual vaccination. If you have further questions or believe your dog leads a healthy and “outdoorsy” lifestyle, please speak to your veterinarian about a tailored vaccination program to ensure your furry family member is protected.